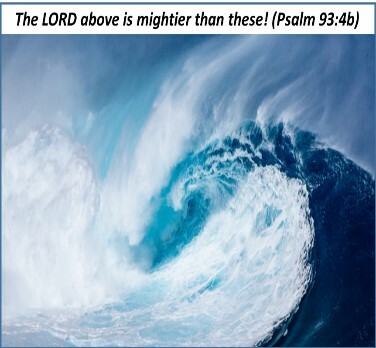 Stand Firm and Tall; Our God Above Is Mightier Than These! God is compassionate and full of mercy. He saw the suffering of the Israelites under the harsh treatments of Mediante. God picked Gideon, because God foresaw what Gideon could do for Him when he was filled with God’s spirit. As the God’s time came, the Spirit of the LORD took possession of Gideon. 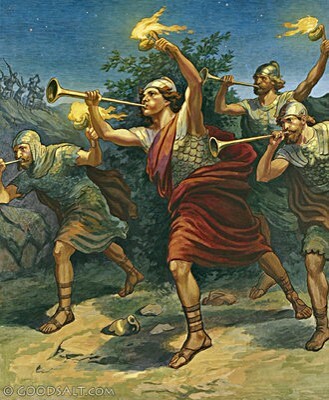 Gideon blew a ram’s horn as a call to arms, and the men of the clan of Abiezer came to him. He also sent messengers throughout Manasseh, Asher, Zebulun, and Naphtali, summoning their warriors, and all of them responded. Gideon and the people of Israel were ready to fight against the oppressing Midianites and their allies. 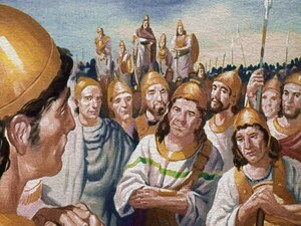 Gideon and his army got up early and went as far as the spring of Harod. The armies of Midian were camped north of them in the valley near the hill of Moreh. Gideon was about to attack the armies of Midian. Then God said to Gideon, “You have too many warriors with you. If I let all of you fight the Midianites, the Israelites will boast to me that they saved themselves by their own strength. Therefore, tell the people, ‘Whoever is timid or afraid may leave this mountain and go home.’” (Judges 7:2-3) God warned Gideon and the people against their proud egos. They heard God, and 22,000 of them went home, leaving only 10,000. Less than one third of people remained. Gideon looked around the 10,000 people. They were brave enough to defeat the entire armies of Midian. Gideon, although he was driven by the Spirit of God, he still possessed the remnant of human nature – his own eyes. To him, it looked still good enough to defeat the enemies. God could not leave him alone, who still counted on his judgement. God told again, “There are still too many!” Then God reduced his army down to mere 300 men. God completely stripped off his earthly confidence. Again, Gideon had to send 9,700 warriors home. Then Gideon looked around, and recalled he had enough warriors filling the entire valley. But now he had only handful of 300 men. The enemies were filled with the entire land. They were the armies of Midian, Amalek, and the people of the east formed an alliance against Israel. Gideon asked himself, “How to fight against the huge number of allied enemies with only 300 men?” The answer was clear. He couldn’t. (It was God’s plan.) Gideon, then, realized that there was no one except God who could lead him a victory. Gideon quickly saw this. He came to God and hold Him tight in faith. Rather than being in fear, he chose to stand firm and tall in faith with his 300 men in God. This truly pleased God. God told Gideon, “With these 300 men I will rescue you and give you victory over the Midianites.”(Judges 7:7a) Yes, Gideon bowed down to God, and believed. That night God said, “Get up! 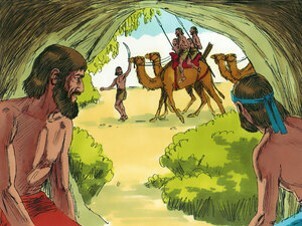 Go down into the Midianite camp, for I have given you victory over them! But if you are afraid to attack, go down to the camp with your servant Purah. Listen to what the Midianites are saying, and you will be greatly encouraged. Then you will be eager to attack.” God, who dearly loved Gideon, came to Gideon, and told what to do to encourage him. So Gideon took Purah and went down to the edge of the enemy camp. The armies of Midian, Amalek, and the people of the east had settled in the valley like a swarm of locusts as they expected. Their camels were like grains of sand on the seashore—too many to count! Both Gideon and Purah saw the formidability impossible reality. How many times have we experienced what Gideon just encountered? Despite of all kinds of odds and difficulties, we believed in God. Then in faith, we moved forward. However, when the reality hit, it was not just big, but beyond imagination - so huge that we could not describe. Simply it was impossible. Then did the reality make us doubt and question – was this really God’s will? What a comforting God was He to Gideon! God knew exactly Gideon’s heart. God touched his heart and take away the last drop of his doubt. God needed a person who was absolutely obedient even before an impossibility, and exactly did what God wanted. When Gideon heard the dream and its interpretation, he bowed in worship before the LORD. God assured Gideon that the victory was in God’s hand, and God had already provided the victory. Then he returned to his camp with God in praise and joy. 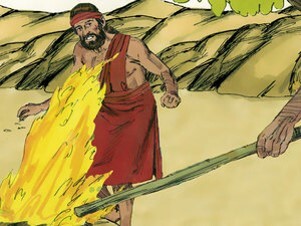 Gideon divided the 300 men into three groups and gave each man a ram’s horn and a clay jar with a torch in it. Gideon asked them not to carry swords, not even one single sword, nor a shield. How craze Gideon’s command was! They were about to fight against the formidable and countless many enemies. Before them, a couple of swords (even 300 swords) would do nothing. Gideon knew this, and in faith, he decided completely to lean on God and to receive the victory prepared by God. Essentially, Gideon completely emptied himself by reducing him down to nothing. No sword and no shield except faith. 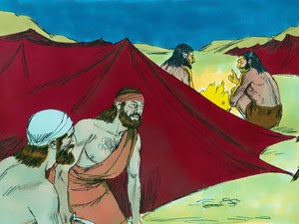 Gideon and his 300 men were completely bare before the enemies. The 300 men also truly believed. Nobody complained, even one single word. They looked each other, and in faith, quietly they followed Gideon’s direction. They were one in one faith in God for God’s power, victory and glory. Then Gideon said to them, “Keep your eyes on me. When I come to the edge of the camp, do just as I do. As soon as I and those with me blow the rams’ horns, blow your horns, too, all around the entire camp, and shout, ‘For the LORD and for Gideon!’” Gideon’s instruction was clear. God the first and Gideon the second. Each man stood at his position around the camp and watched as all the Midianites rushed around in a panic, shouting as they ran to escape. When the 300 Israelites blew their rams’ horns, the LORD caused the warriors in the camp to fight against each other with their swords. Those who were not killed fled. It was a huge victory. Nobody drew sword, not even one single sword, but God’s sword was greater. Nobody fought against the enemies, but God fought for them. Before God, the enemies were confused, they killed each other. 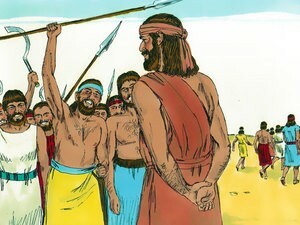 Gideon and the 300 men saw the enemies were being reduced by themselves by killing each other. The enemies were utterly destroyed by God’s raised hand. They stood before God while watching the awesome scene. They praised God, and praised God’s name with the highest voice for His glory. Do we confront with an impossibility that is absolutely beyond us? Then we lift up our eyes, and look up Our God, who is ever-loving Father, and then remember what God did to Gideon and his 300 men. They did not draw even one single sword, but God utterly destroyed the enemies before their very eyes. Gideon and his 300 men believed, and God answered. God’s power and His glory were magnified. The same God, who was with Gideon and the 300 men, is with us even at this very moment. Do we believe? Victory Over Impossibility In Him! God has always prepared for His people. When the people of Israel did evil before the sigh of God, God put them under the Midianites for seven years. The Midianites were so cruel that the Israelites made hiding places for themselves in the mountains, caves, and strongholds. They stayed until the land was stripped bare. So Israel was reduced to starvation by the Midianites. It was truly painful, but it was God’s purification process for the people of Israel. The purification time was up, and the people of Israel were ready. God picked one person, whose name was Gideon. He was not a proud man because he had nothing to show to others. God came to him, and told him to rescue Israel. “But God,” Gideon replied, “how can I rescue Israel? My clan is the weakest in the whole tribe of Manasseh, and I am the least in my entire family!” God used the least and weakest one because He saw Gideon’s heart, which couldn’t be seen by people’s eyes. Then God gave Gideon the weighty mission of rescuing His people, the Israelites. Yes, God picked Gideon not because Gideon was brave and mighty enough to rescue the Israelites from the dominating Midianites. God foresaw what Gideon could do for Him when he was filled with God’s spirit. God also exactly knew that at the moment, Gideon, as he was, was not ready for the God’s mighty task -- rescuing the entire Israelites. God had to transform the coward Gideon to the truly faithful and mighty one who could lead the people of Israel in the name of God without any fears and doubts. Yes, this was the God’s plan prepared for Gideon and the people of Israel. God called him, and through His angel said, “Mighty hero, the LORD is with you!” (Judges 6:12). Per God’s direction, that night, Gideon took ten of his servants. He went up to the alter of Baal, demolished the alter of Baal, cut down the Asherah pole besides the alter, instead built an alter for God on the hilltop, and gave sacrifice to God using as fuel the wood of the Asherah. Gideon passed the test, and he proved his faith before God. 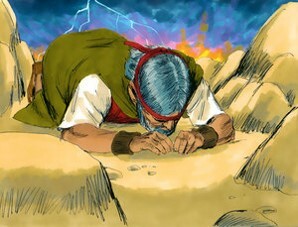 Gideon was ready to take the mighty task from God – saving the Israelites. Soon afterward the armies of Midian, Amalek, and the people of the east formed an alliance against Israel and crossed the Jordan, camping in the valley of Jezreel. Then the Spirit of the LORD took possession of Gideon. He blew a ram’s horn as a call to arms, and the men of the clan of Abiezer came to him. He also sent messengers throughout Manasseh, Asher, Zebulun, and Naphtali, summoning their warriors, and all of them responded. Gideon and the people of Israel were ready to fight against the oppressing Midianites and their allies. In fact, God had an even bigger and grander plan for the Israelites. The people of Israel under the Gideon’s leadership could defeat the Midianites and their allies because they were all filled of courage. However, God worried about the hearts of the Israelites after the victory. They would give all credits to themselves, while slowly and completely forgetting God. How many times have we experienced this in us? A huge success in our earthly life often becomes the most deadly poison for our spiritual life before God. Our ego is the most formidable foe, especially when it allies with our unshakable desire of crowing ourselves as our own master. Soon we don’t even remember how God rescues us from our suffering and misery. Without knowing God’s true plan, Gideon and his army got up early and went as far as the spring of Harod. The armies of Midian were camped north of them in the valley near the hill of Moreh. Gideon really ready to attack the armies of Midian. Then God said to Gideon, “You have too many warriors with you. If I let all of you fight the Midianites, the Israelites will boast to me that they saved themselves by their own strength. Therefore, tell the people, ‘Whoever is timid or afraid may leave this mountain and go home.’” (Judges 7:2-3) God warned Gideon and the people against their proud egos. They heard God, and responded to Gideon’s call, 22,000 of them went home, leaving only 10,000 who were willing to fight. Less than one third of people remained. Gideon looked around the 10,000 people, who looked really brave enough to defeat the entire armies of Midian. But the LORD told Gideon, “There are still too many!” Gideon could not believe what he was hearing. God made his army reduced by two thirds. He only had 10,000. Despite of this fact, Gideon was about to fight for God for His victory. However, God stopped Gideon to remind who God was. Then Gideon took his warriors down to the water. God’s plan was continuously unfolding. God told him, “Divide the men into two groups. In one group put all those who cup water in their hands and lap it up with their tongues like dogs. In the other group put all those who kneel down and drink with their mouths in the stream.” Only 300 of the men drank from their hands. 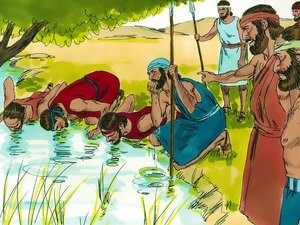 All the others got down on their knees and drank with their mouths in the stream. Then God told Gideon, “With these 300 men I will rescue you and give you victory over the Midianites. Send all the others home.”(Judges 7:7) So Gideon collected the provisions and rams’ horns of the other warriors and sent them home. But he kept the 300 men with him in his strong and unmovable faith in God. He stood firm and tall in his faith before God, and with the people around Gideon. The 300 men saw him, as well as the 9700 who were reluctantly sent home. What a scene before men and God! This was the faith – expecting God’s victory under an impossibility. The courage and faith willing to fight against the numerous armies of Midianites and their allies with the minuscule number of his army of the 300 men was alone a true victory even before starting physically fighting. God saw the faith of Gideon and the 300 warriors. This pleased God, and the victory in God was sure. Are some of us confront with an impossibility? Then let’s fully recognize that it is not a battle for our own might and strength, but for proving our faith in Him. We might have completely forgotten His mighty hand and love as the distant past of our lives. 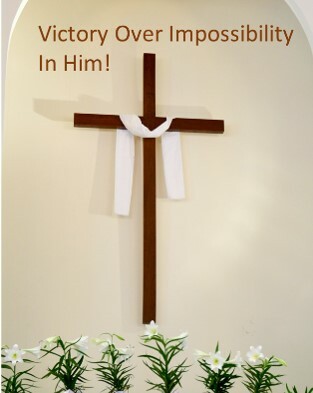 The impossibility with which we confront is an telltale signal specially designed for us by God to remind us who He is and what He has done in our lives, and again for us to strongly hold Him as our true and only master of our lives. Therefore, when we meet an impossibility in our lives, we fix our eyes on Him, and return the impossibility to Him. Anyway, it truly belongs to Him, not us. Then we stand firm and fall in faith in Him. This is our faith and our victory in Him who so loved us that He gave His one and only Son. Give thanks to God, who has already prepared our victory from the impossibility before us as well as the eternal victory in Him. Praise Him! Mighty Hero, God Is With You! The Israelites did evil in the God’s sight. So the God handed them over to the Midianites for seven years. The Midianites were so cruel that the Israelites made hiding places for themselves in the mountains, caves, and strongholds. Whenever the Israelites planted their crops, marauders from Midian, Amalek, and the people of the east would attack Israel, camping in the land and destroying crops as far away as Gaza. They left the Israelites with nothing to eat, taking all the sheep, goats, cattle, and donkeys. These enemy hordes, coming with their livestock and tents, were as thick as locusts; they arrived on droves of camels too numerous to count. And they stayed until the land was stripped bare. So Israel was reduced to starvation by the Midianites. This was what God did. Why? Did God not loved the Israelites anymore? No. God dearly loved them. God wanted to them to come back to God although they sinned against God. 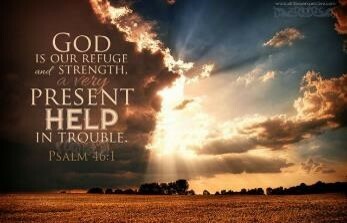 The Israelites had no place to go for help, but God. They knew their sins that they committed before God, and they also knew all the hardships caused by themselves, because they did evil in the God’s sight. Like a kid, they cried out to the Lord, their God, for help. When they cried out to God, He heard their cry. Rather than focusing on their sins committed, God, who dearly loved their children like parents, came to them. Like parents, God had not forget their children under any circumstances. God always watched over the Israelites with His love and care. Sure. They cried, and God heard it. God sent an angel for them. The angel came down and sat beneath the great tree at Ophrah, which belonged to Joash of the clan of Abiezer. Gideon, son of Joash, was threshing wheat at the bottom of a winepress to hide the grain from the Midianites. Gideon was really afraid of the Midianites. He knew they would take away what he had. He was in great fear. The angel of the LORD said to Gideon, “Mighty hero, the LORD is with you!” (Judges 6:12) Gideon could not believe what he heard. He was hiding in a winepress and threshing wheat, but the angel called him “Mighty hero, God is with you!” He could not believe what he was hearing. Gideon knew he was not a brave man, let alone be a mighty hero. Although the angel said “God is with you.” He could not feel God’s presence anywhere. What he was able to see was the fearful Midianites. Thus he turned his head, and saw the person who was telling. He was not an ordinary person. Gideon looked carefully, and soon realized that the person who talked to him was an angel of God. Gideon had lots of questions about God like the rest of the Israelites. He was also fearful before the angel. Gideon was silent for a moment in fear, but he could not hold up the silence any longer. He courageously opened his mouth and put out his heart, “Sir, if God is with us, why has all this happened to us? And where are all the miracles our ancestors told us about? Didn’t they say, ‘The God brought us up out of Egypt’? But now the God has abandoned us and handed us over to the Midianites.” (Judges 6:13) Gideon like the other Israelites felt that God abandoned the people of Israel, the God’s people. There was no sign of God’s hand, and the oppression of the Midianites was getting severer every day. For Gideon, it was the unavoidable reality that he experienced every moment in his life. “But God,” Gideon replied, “how can I rescue Israel? My clan is the weakest in the whole tribe of Manasseh, and I am the least in my entire family!” Gideon knew himself very well. Even at the very moment, he was hiding and threshing wheat. Additionally, his clan was the weakest, and he is the least in his entire family. God picked Gideon to rescue the Israelites from the Midianites not because Gideon was brave and mighty enough to rescue the Israelites from the dominating Midianites. God foresaw what Gideon could do for Him when he was filled with God’s spirit. God also exactly knew that Gideon was not ready for taking the God’s mighty task -- rescuing the entire Israelites. God had to transform the coward Gideon by carving out the truly faithful and mighty one who could lead the people of Israel in the name of God without any fears and doubts. Yes, it was the God’s plan for Gideon and the people of Israel. The first agenda of God was to make Gideon to truly believe God’s calling and obedient to Him. God had to remove his doubts and fears from Gideon’s heart so that God could build up an unparalleled faith in Gideon. Gideon hurried home. He cooked a young goat, and with a basket of flour he baked some bread without yeast. Then, carrying the meat in a basket and the broth in a pot, he brought them out and presented them to the angel, who was under the great tree. The angel of God said to him, “Place the meat and the unleavened bread on this rock, and pour the broth over it.” And Gideon did as he was told. Then the angel of God touched the meat and bread with the tip of the staff in his hand, and fire flamed up from the rock and consumed all he had brought. And the angel of God disappeared. It was a just beginning: Gideon saw the angel of God, and heard unbelievable message – “Mighty hero, the LORD is with you!” God started good work, and continued His plan in Gideon. Now God’s training had been just started. First, God asked to destroy his father’s alter for Baal, a false god. 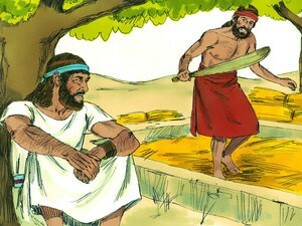 God wanted to directly against Baal by destroying the alter for Baal, which was owned by his father. It was a real tester of Gideon’s faith – against his own father and the idol that his father was keeping. Second, he cut down the Asherah pole standing beside the alter of Baal. Third, build an alter for the Lord at the hilltop, not in a hidden vally. Remember that he was so coward that he was hiding and working at the bottom of winepress. 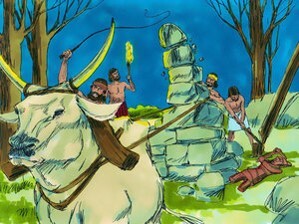 Fourth, give a sacrifice to God by burning the Asherah pole. What was the Gideon’s response? Yes, Gideon did all. Gideon took ten of his servants and did as God had commanded. However, he did it at night because he was afraid of the other members of his father’s household and the people of the town. Gideon had just started his journey of faith in God, but he had not have a perfect faith yet. He was still afraid of his father’s household and the people in the town. He barely passed the test of faith in God. It was true that he was still looking around to the people, rather than completely fixing his eyes on God. God valued Gideon’s small faith. Indeed, Gideon was not perfected in faith yet. God saw what Gideon did. God raised His hand and protected Gideon. Before God, nothing was impossible. Gideon should have been afraid of his father most. His father was the person who took care of the alter of Baal. Gideon knew what would come after if he destroyed the alter of Baal, but in faith Gideon destroyed the alter following God’s command. Upon Gideon’s faithful act, God did not let Gideon alone. God touched his father heart to change his father. 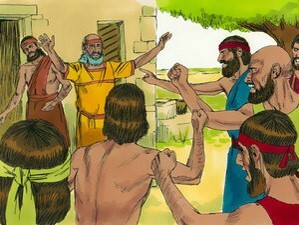 God defended against the rest of the people in the town by using the mouth of Gideon’s father. This was what God did upon Gideon’s faithful act. pleases with our small faith – following God’s command. Our faith might not be perfect as Gideon did – still afraid of the things on earth. For God’s sight, it is not so important. The important one is whether we followed God’s command or not. When we follow through God’s command, it is the moment that brings a true joy to God. God saw the baby steps of Gideon in faith. Gideon was almost falling, but God stretched out His mighty hand. With His great power, God first changed his father, who was most feared. Then God used his father to defend Gideon by making the entire town silent. God truly rejoices over our baby steps in faith. Surely, we feel still fearful about many things in our heart or in the world. God does not let us alone. 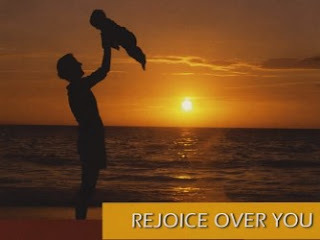 He stretches His mighty hand, and protect us in His love, not because we did everything perfect in faith, but because He rejoiced over our baby steps in faith. This is our faith. God is always with us, and protects us. What He wants is that we grow in faith in Him. Give thanks to God, who always loves us. Let us to continue experiencing Him every moment and grow in faith in God! Then Call On Me When You Are In Trouble. God dearly loves His people. God brought out the people of Israel from Egypt with many miracles and His Might Hand. He was patient and slow to anger upon the numerous complaints of the people of Israel. God took them to the Mount Sinai, and make them take rest in God. They finally rested in the hands of God. The God gave them His Commandments, Laws and Regulations to truly be His people forever. It was a real blessing. God was with them, and they were in God's hand safe and in peace. God called Moses: “Come up here to me again.” Before going back to God, Moses carefully wrote down all the LORD’s instructions that Moses received. Early the next morning Moses got up and built an altar at the foot of the mountain. He also set up twelve pillars, one for each of the twelve tribes of Israel. Then he sent some of the young Israelite men to present burnt offerings and to sacrifice bulls as peace offerings to the LORD. Moses drained half the blood from these animals into basins. The other half he splattered against the altar as God commanded. It was a manifestation of God's love to show how terrible sins were and the consequences of sins, i.e., blood and death. God imposed their sins to the animals to remind the nature of sins and forgiveness of God from His mercy and love. Then he took the Book of the Covenant that he wrote, and read it aloud to the people. Again they all responded, “We will do everything the LORD has commanded. We will obey.” Moses took the blood from the basins and splattered it over the people, declaring, “Look, this blood confirms the covenant the LORD has made with you in giving you these instructions and His forgiveness and mercy.” Moses truly prepared the people of Israel fully and completely. They also responded that they would obey what God told to them. Then Moses climbed up the mountain, and the cloud covered it. And the glory of the LORD settled down on Mount Sinai, and the cloud covered it for six days. On the seventh day the LORD called to Moses from inside the cloud. To the Israelites at the foot of the mountain, the glory of the LORD appeared at the summit like a consuming fire. Moses disappeared into the cloud as he climbed higher up the mountain. He remained on the mountain forty days and forty nights. God, then, gave detailed instructions how to build the Tabernacle, the Ark, the Table of the Bread of the Presence of God, the Lamp stand before God, the clothing for the priests, and other details how to worship Him. When the LORD finished speaking with Moses on Mount Sinai, he gave him the two stone tablets inscribed with the terms of the covenant, written by the finger of God. God loves the people of Israel, and He spent the forty days with Moses to give all of the details of how to worship God. 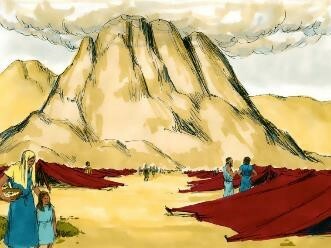 At the foot of the mountain, the people of the Israel waited for Moses’ returning. They waited and waited, but Moses did not return. When the people saw how long it was taking Moses to come back down the mountain, they were getting nervous. The entire camp was unsettling, and everyone felt vulnerable without Moses, the true leader who brought them from Egypt. It was not Moses, but God who brought out them from Egypt. Indeed, their faith was at infancy with God. Like a baby, they could not discern what the truth was and who God was. We all know God dearly loves us, and He never leaves and forsakes us under any situations. Without a deeper root in faith, the people of Israel felt very insecure without Moses, who was a real person. They could physically see, but God was invisible. Aaron thought that he really needed something to lean on and hold on in the time of fear. He also clearly knew that the other people was searching for the same. He had to make something to make him and the rest feel secure again. Aaron pondered about something that could be easily recognized by all of the people, and be considered to be sacred enough to take away all of their fears and insecurity. He came to a conclusion to create a golden calf that surely visibly stood out to give feeling of security, and most of all, the people could come, touch and feel it. It was a perfect one, Aaron thought. 2. You shall not make for yourself an image in the form of anything. (Exodus 20:4a). As expected, Aaron saw the people were really excited. Once he started, he could not stop. So he built an altar in front of the calf. Then he announced, “Tomorrow will be a festival to the LORD!” Aaron exactly replicated what God instructed to Moses up in the mountain! Aaron mislead the people, and made them sin, which was infectious and growing quickly to make all to commit the grave sin of creating and worshiping the idol. Then the people got up early the next morning to sacrifice burnt offerings and peace offerings. After this, they celebrated with feasting and drinking, and they indulged in pagan revelry. It was a really sad moment that one leader made all of the Israelites sin. The millions people of Israel was driven by one person, Aaron, to sin while breaking the very first and second Commandments. When we read about the sins of Aaron and the people of Israel – making a golden calf with their most precious possessions, i.e., gold, and worshiping the idol, we easily think we are different. 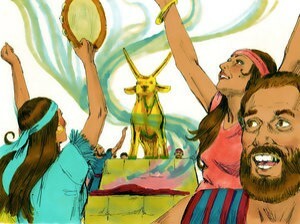 We say that we are not so foolish to create our own golden calf like them. Of course, none of us physically gather gold, melt it, and make a golden calf. Thus, we might say we are immune to such a sin. Is it a really true statement? What’s our response when we confront with a prolonged insecurity in life, and our fear is mounting up as time goes by? Like the people of Israel waited for Moses at the foot of the mountain, we have been waiting long time, but nothing has been changed. Our life pain continues. Then what do we do? Do we relentlessly and continuously pray to God in faith without doubting Him and looking for His mercy and love?